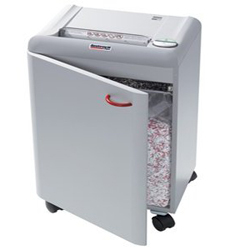 Destroyit 2404CC Cross-Cut Paper Shredder is an ideal desk-side shredder for offices and homes. 2404CC is equipped with SPS (Safety Protection System) and ESM (Energy Saving Mode). It also shreds credit cards, staples and paper clips. MBM Destroyit 2404CC shredder has an amazing quiet and powerful performance. Double protection against overheating is also featured. Because of its several benefits, Destroyit 2404CC is a perfect choice. Dimension 11 3/4" x 15 1/2" x 28 3/4"